Third-ranked Burlingame will travel to St. Paul with a spot in the state semifinals on the line. St. Paul has reached the second round of the playoffs for the first time since 2008, while Burlingame enjoyed a similar deep playoff run last season before falling to Hanover in the state semifinals. The Bearcats opened the playoffs on Tuesday with a high-scoring 72-46 win over Solomon. Burlingame surrendered almost as many points in that game as had combined all season. Burlingame entered having given up only 54 points all season. Junior quarterback Dalton Sporing rushed for 159 yards and four touchdowns and threw for 135 more yards and four touchdown passes to four different receivers. For the season, Sporing has passed for 1,189 yards and 27 touchdowns agasint only three interceptions. He’s also rushed for 1,090 yards and 26 scores. Dominic Buterakos is second on the team in rushing with 745 yards and nine scores, while Seth Greenwood has 535 yards and seven touchdowns. Junior Colton Noonan leads the receivers with 32 catches for 534 yards and 12 touchdowns, while Zach Herrick has added 18 receptions for 298 yards and eight scores. Against Solomon on Tuesday, the Bearcat defense also scored a pair of touchdowns in the second half. Junior Tristan Lee leads the defense with 104 tackles, including 14 for loss and nine quarterback sacks. St. Paul reached the second round by building a big lead over Peabody-Burns and cruising to a 78-32 win. The Indians led 48-6 late in the second quarter before the Warriors scored just before halftime to extend the game. St. Paul senior Chandler Struthers scored four of his five rushing touchdowns in the first half. Braven Born and Austin Reynolds also added a pair of rushing scores for the Indians. Struthers finished with 193 yards on the night before leaving early to rest some nagging injuries. The Indians will need a healthy Struthers in order to get by the talented Bearcats. For the third straight season, the two powerhouses match up in the second round of the playoffs. In 2014, Central Plains won, 42-40, at home in a memorable game and went on to capture the state title. Last year, Spearville won 58-28 at home in its closest game all season en route to a 13-0 mark and state crown. This season, Spearville has been ranked first or second all year and has won 23 straight contests, the longest current winning streak in Kansas. Spearville is 33-1 since the start of the ’14 with the only defeat to Central Plains. Central Plains graduated a large senior class but has won at least nine games for the fourth straight fall and the fifth time in six years since Claflin and Quivira Heights consolidated. Spearville’s single-wing offense has continued to produce at an elite pace after graduating standout quarterback Nathan Stein and junior running back Bailey Sites was hurt for most of this season. The Lancers have rolled in each contest with one game by 32 points and the rest by the 45-point margin. Spearville often blows teams out in the first quarter with workmanlike efficiency. The Lancers average 10.2 yards per play. Senior Luke Heskamp has 73 carries for 981 yards and 19 rushing scores. Sophomore Kolby Stein has capably stepped in and completed 25 of 38 passes for 519 yards with 10 scores against one interception. He has 71 rushes for 645 yards and 12 scores. Spearville, known for few turnovers, have four miscues and are plus-17 in turnover margin. The Lancers defeated Atwood, 52-6, in the first round of the playoffs. Spearville has outscored teams 568-78, while Central Plains is at 558-108. The Oilers, unranked to start the season after a large senior class graduated, earned three big league wins in the first three weeks, including a last-second road win versus Otis-Bison. On Tuesday, Central Plains trailed several times in the first half, including 20-16 late in the first half. However, the Oilers scored 44 unanswered points and defeated Argonia-Attica, 60-20, for the win. Central Plains’s run defense limited A&A to 24 carries for 77 yards. The Oilers forced four turnovers. Sophomore Devin Ryan has played very well at quarterback, and junior Alex Barton is one of the state’s top playmakers at wide receiver with 16 receiving touchdowns. On Tuesday, Alex Hickel rushed for four touchdowns. Ryan threw two scoring passes and 149 passing yards, and Dalton Beck had 80 rushing yards. Ryan has 30 scores against just two interceptions. Central Plains has now forced 28 turnovers this season. Two major keys are turnovers and the play of Barton. In the 42-40 loss, Spearville had the yardage edge, 332-259. Central Plains’s defense forced four turnovers and was plus-2 in turnover margin – incredibly rare numbers for the Lancers. This season, the Oilers have often used turnovers to their advantage, specifically the Otis-Bison comeback win and Tuesday. 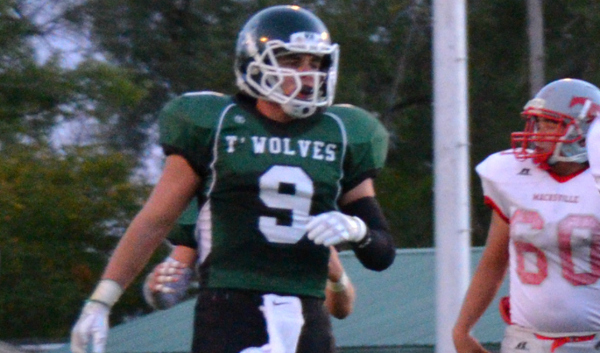 In the Spearville win, then-Central Plains standout Layne Bieberle had 240 all-purpose yards and two scores. Barton is very similar to Bieberle and has scored in all facets. He must have a huge game in the three phases for Central Plains. The Oilers give Spearville its closest game of the year, but the Lancer juggernaut is just too hard to slow down.